Although going into the ceremony, it seemed like most things were pretty set in stone, there were actually a fair amount of surprises present at the 2016 Oscars. Mark Rylance beat out Sylvester Stallone for Best Supporting Actor, Ex Machina won Best Visual Effects, and, perhaps most interestingly of all, Ennio Morricone won for Best Score, making him the oldest Oscar winner ever. Yes, really — the 87-year-old beat an Academy Awards record held by Christopher Plummer, who, at 82, won an Oscar for a supporting acting role in Beginnersin 2012. Pretty damn impressive. It's exciting to see Morricone win such an honor, as the composer is nothing short of legendary; in addition to doing the music for his Oscar-winning The Hateful Eight, he's composed hundreds of movie scores for iconic films like Days of Heaven and The Untouchables, released several critically acclaimed albums, and has been inducted into the Grammy Hall of Fame, among (many) other achievements. His Oscar win for the Quentin Tarantino film, while certainly noteworthy for the record it broke, is simply one of the countless impressive accomplishments in Morricone's decades-long career. 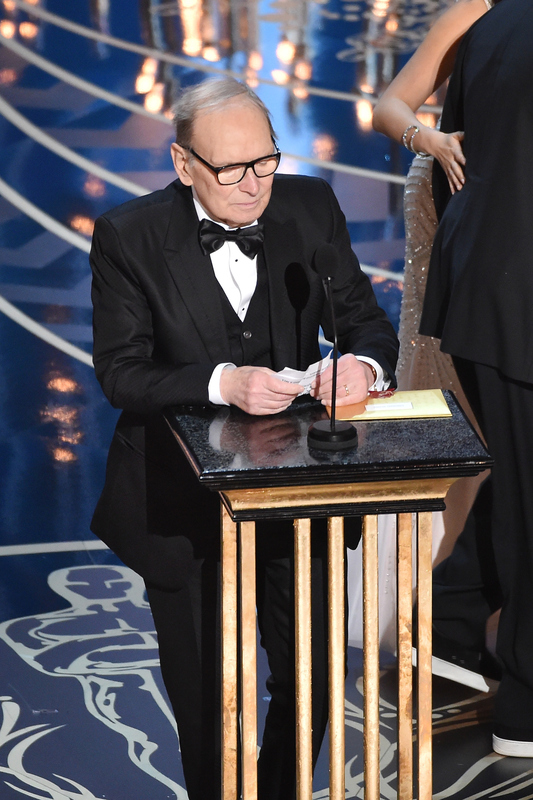 It wasn't his first Oscar win, either; in 2007, Morricone won an honorary Academy Award that celebrated his massive contributions to the industry. But it is his first competitive Oscar, and it's a great acknowledgment of all the work the composer has done in and out of Hollywood over the course of his career. During his acceptance speech, Morricone thanked several people, including Tarantino and Harvey Weinstein, and talked about the importance of a soundtrack in a movie's success — something that his career has proven is true. Congrats to Morricone for not only breaking a major Oscars record, but for continuing to have such an important presence in the film and music industries.